Multiple fire departments are battling grass fires across Green Country on Tuesday. One fire was reported near Mannford along Highway 51 and South 281st West Ave. Residents tell us they've been watching as flames and smoke approach their homes. They haven't been told to evacuate, but at least one neighbor was packing up belongings just in case. "We're all scared and a little sad," Mannford resident Alma Nelson said. "I've lived here 25 years, so I don't want to lose everything we have, but we have faith in the firefighters..."
"We have water right now, but we’re all on wells, so if the electricity goes we won’t have any water," Nelson said. Some residents are wearing protective masks over their mouths to protect them from smoke inhalation. Firefighters are expected to be working the fire overnight. The chief says investigators aren't sure what the cause of the fire was. Other fires reported on Tuesday included one near South 161st West Ave. and West 81st Street South in Sapulpa, where firefighters put out an flames at an abandoned mobile home. They say their trucks were stuck in the mud because the ground was wet, and while they were being pulled out, the fire spread and burned several hay bales. "People need to be very mindful of the weather conditions and the wind," Sapulpa Fire Capt. Forrest Fields said. "We have lower humidity today and the winds are up, anytime you have that you have conditions for any kind of brush fires so they need to avoid any outside burning." The Oklahoma Forestry Service fire situation report ahead of Tuesday warning of winds that could present a fire danger. Sapulpa officials told 2 Works For You they believe the fire was caused by arson. 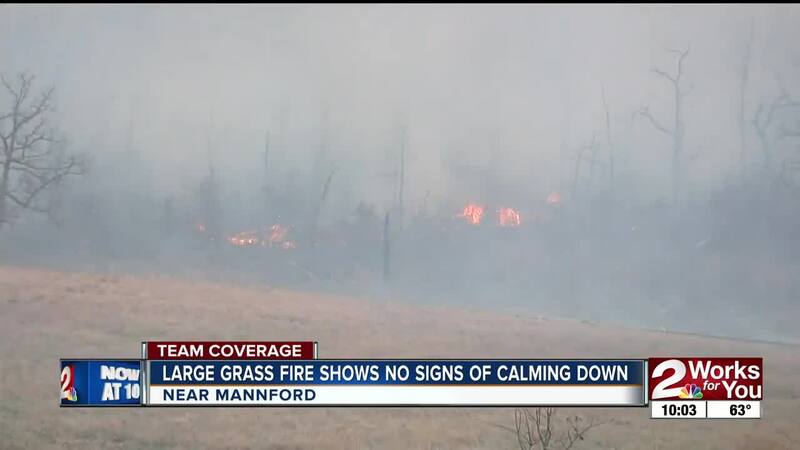 Several other grass fires have been burning in the Tulsa metro as well. A grass fire on Highway 99 about 2 miles north of Cleveland has caused firefighters to set a back burn to control a spreading fire there. Officials say the fire began southwest of Osage near the Arkansas River. Crews were able to light a back burn near Highway 99 from Proctor’s Corner south to the bridge just north of the Arkansas River Bridge in order to bring flames under control. The Oklahoma Highway Patrol diverted highway traffic down Boston Pool Road and Prue Road ahead of the back burn, then Highway 99 was shut down about two hours while the back burns were set. During that time, troopers worked a crash where someone rear-ended a fire truck, they said. Emergency management and firefighters alerted all residents in the line of fire and safety zones were burned around structures in the path, officials say. No word on the cause of that fire.